Partition Systems/Standard - Super-Vision | David's Inc. 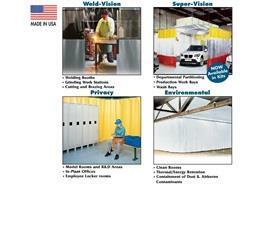 The Track & Roller Partition System is the ideal solution to industrial space utilization and organization. Flexible partitions roll easily out of the way when you don't need it, or when you need access to partitioned areas. All partitions are constructed with nickel plated brass grommets every 12" across the top reinforced edge. Vinyls resist fire, water, oil, mildew, most acids and are CA. Fire Marshall (CFM) approved. Tear resistant. All partitions utilize the same hardware components. Rugged straight track and curved corners are made of 16 ga. hot dipped galvanized steel. 1" swivel hooks are fastened to 2 wheel, industrial strength nylon rollers which are designed for smooth, fluid movement. FOB Shipping Point. 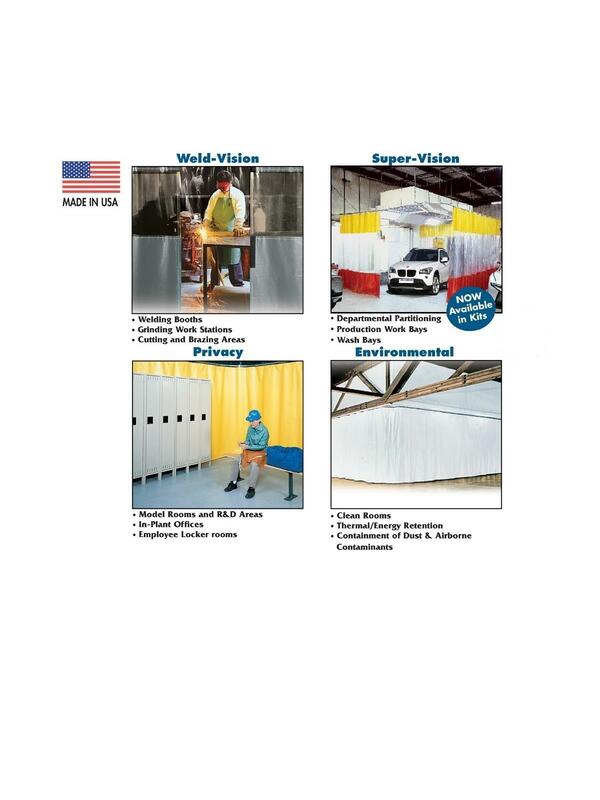 Weld-Vision, Privacy, and Environmental styles are also available please see the Related Items tab below for more details and to order. Measure Off Area: to partition or enclose. Can be a straight run, 2, 3, or 4 sided or multi-station partition. Determine the Height: and order partitions to the exact height required. (Tolerance 1") Floors are not always even, take measurement from the highest point of the floor. Please Specify Color Choices: White, Yellow, Green, Blue, Red, Gray or Black. Hanging Or Mounting Method: Kits consists of panel, steel track, chain connector, threaded rod adapter, end stops and 2-wheel nylon roller hooks. Rugged Universal Mounting Hardware ... All hardware has a proven history of longevity and functional durability. Ask for details. Please call for a quote. Our knowledgeable staff can assist in solving specific or unusual in-plant, safety and noise problems. We can recommend the right combination among our standard products, or we'll design custom solutions that fit your particular needs. 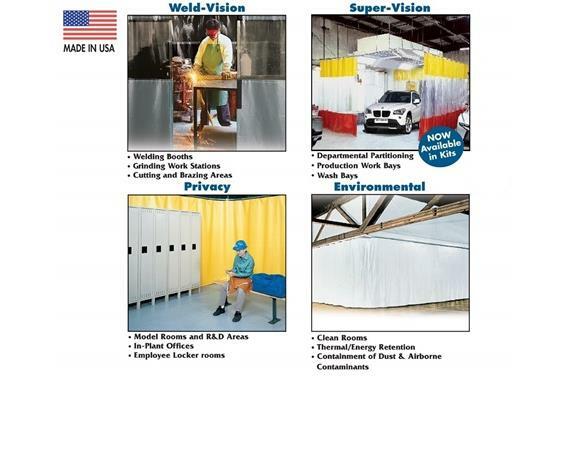 See Related Items tab for Partition Systems/Standard - Weld Vision, Partition Systems/Standard - Environmental and Partition Systems/Standard - Privacy.